Starchy substances constitute the major part of the human diet for most of the people in the world, as well as many other animals. They are synthesized naturally in a variety of plants. Some plant examples with high starch content are corn, potato, rice, sorghum, wheat, and cassava. It is no surprise that all of these are part of what we consume to derive carbohydrates. Similar to cellulose, starch molecules are glucose polymers linked together by the alpha-1,4 and alpha-1,6 glucosidic bonds, as opposed to the beta-1,4 glucosidic bonds for cellulose. In order to make use of the carbon and energy stored in starch, the human digestive system, with the help of the enzyme amylases, must first break down the polymer to smaller assimilable sugars, which is eventually converted to the individual basic glucose units.Because of the existence of two types of linkages, the alpha-1,4 and the alpha-1,6, different structures are possible for starch molecules. An unbranched, single chain polymer of 500 to 2000 glucose subunits with only the alpha-1,4 glucosidic bonds is called amylose. On the other hand, the presence of alpha-1,6 glucosidic linkages results in a branched glucose polymer called amylopectin. The degree of branching in amylopectin is approximately one per twenty-five glucose units in the unbranched segments. Another closely related compound functioning as the glucose storage in animal cells is called glycogen, which has one branching per 12 glucose units. The degree of branching and the side chain length vary from source to source, but in general the more the chains are branched, the more the starch is soluble. Starch is generally insoluble in water at room temperature. Because of this, starch in nature is stored in cells as small granules which can be seen under a microscope. Starch granules are quite resistant to penetration by both water and hydrolytic enzymes due to the formation of hydrogen bonds within the same molecule and with other neighboring molecules. However, these inter- and intra-hydrogen bonds can become weak as the temperature of the suspension is raised. When an aqueous suspension of starch is heated, the hydrogen bonds weaken, water is absorbed, and the starch granules swell. This process is commonly called gelatinization because the solution formed has a gelatinous, highly viscous consistency. The same process has long been employed to thicken broth in food preparation. Depending on the relative location of the bond under attack as counted from the end of the chain, the products of this digestive process are dextrin, maltotriose, maltose, and glucose, etc. Dextrins are shorter, broken starch segments that form as the result of the random hydrolysis of internal glucosidic bonds. A molecule of maltotriose is formed if the third bond from the end of a starch molecule is cleaved; a molecule of maltose is formed if the point of attack is the second bond; a molecule of glucose results if the bond being cleaved is the terminal one; and so on. As can be seen from the exercises in Experiment No. 3, the initial step in random depolymerization is the splitting of large chains into various smaller sized segments. The breakdown of large particles drastically reduces the viscosity of gelatinized starch solution, resulting in a process called liquefaction because of the thinning of the solution. The final stages of depolymerization are mainly the formation of mono-, di-, and tri-saccharides. This process is called saccharification, due to the formation of saccharides. Since a wide variety of organisms, including humans, can digest starch, alpha-amylase is obviously widely synthesized in nature, as opposed to cellulase. For example, human saliva and pancreatic secretion contain a large amount of alpha-amylase for starch digestion. The specificity of the bond attacked by alpha-amylases depends on the sources of the enzymes. Currently, two major classes of alpha-amylases are commercially produced through microbial fermentation. Based on the points of attack in the glucose polymer chain, they can be classified into two categories, liquefying and saccharifying. On the other hand, the fungal alpha-amylase belongs to the saccharifying category and attacks the second linkage from the nonreducing terminals (i.e. C4 end) of the straight segment, resulting in the splitting off of two glucose units at a time. Of course, the product is a disaccharide called maltose. The bond breakage is thus more extensive in saccharifying enzymes than in liquefying enzymes. The starch chains are literally chopped into small bits and pieces. Finally, the amyloglucosidase (also called glucoamylase) component of an amylase preparation selectively attacks the last bond on the nonreducing terminals. The type to be used in this experiment can act on both the alpha-1,4 and the alpha-1,6 glucosidic linkages at a relative rate of 1:20, resulting in the splitting off of simple glucose units into the solution. Fungal amylase and amyloglucosidase may be used together to convert starch to simple sugars. The practical applications of this type of enzyme mixture include the production of corn syrup and the conversion of cereal mashes to sugars in brewing. Thus, it is important to specify the source of enzymes when the actions and kinetics of the enzymes are compared. Four types of alpha-amylases from different sources will be employed in this experiment: three of microbial origin and one of human origin. The effects of temperature, pH, substrate concentration, and inhibitor concentration on the kinetics of amylase catalyzed reactions will be studied. Finally, the action of the amylase preparations isolated from microbial sources will be compared to that from human saliva. In this demonstration, the action of two bacterial species, Bacillus subtilis and Escherichia coli, is compared on starch agar. After inoculation in the shape of the corresponding bacterial name initials, EC for E. coli and BS for B. subtilis, the plates were incubated for 24 hours at 37°C. Iodine, which changes color from a yellow-brown to blue-black in the presence of starch, was applied to the agar surface and allowed to stand for 10 minutes . 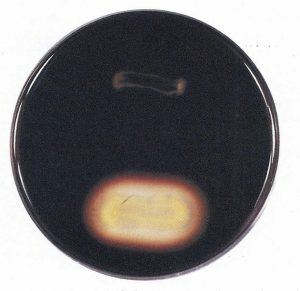 The E. coli starch agar plate turned completely blue-black which indicated that all the starch was still present (Fig. 2.). This is a negative reaction for the starch hydrolysis test. The B. subtilis produced a clear zone around the growth which is a positive reaction (Fig. 1.) and indicates that the starch has been removed in the area around the bacterial inoculum . B. subtilis produced the enzyme amylase which hydrolyzed starch in the agar. 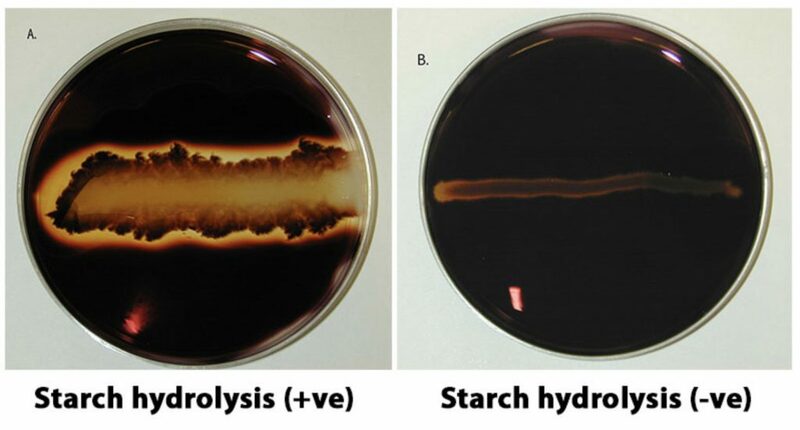 If the species produces and releases amylase, starch hydrolysis in the agar should occur. 1. Bird, R., and R. H. Hopkins. 1954. The action of some alpha-amylases on amylase. Biochem. J. 56 :86–99. 2. Priest, F. G. 1977. Extracellular enzyme synthesis in the genus Bacillus. Bacteriol. Rev. 41 (3) : 711–753. 1. Use a sterile swab or a sterile loop to pick a few colonies from your pure culture plate. Streak a starch plate in the form of a line across the width of the plate. Several cultures can be tested on a single agar plate, each represented by a line or the plate may be divided into four quadrants (pie plate) for this purpose. Incubate plate at 37 °C for 48 hours. Add 2-3 drops of 10% iodine solution directly onto the edge of colonies. Wait 10- 15 minutes and record the results. Positive test (“+”): The medium will turn dark. However, areas surrounding isolated colonies where starch has been hydrolyzed by amylase will appear clear. Negative test (“-“): The medium will be colored dark, right up to the edge of isolated colonies. Figure: Two species are inoculated onto a starch plate and incubated at 30°C until growth is seen (plate on the left). The petri dish is then flooded with an iodine solution and photograph taken after 10 minutes (plate on right). Amylase positive species shows a clearing halo around the growth (top line of growth). Amylase negative species does not have this clear halo (bottom line of growth). Using a marking pen, divide the starch agar plate into three equal sectors. Be sure to mark on the bottom of the plate. Label the plate with the organisms’ names, your name, and the date. Spot inoculate two sectors with the test organisms. Invert the plate and incubate it aerobically at 35°C for 48 hours. Record your results in the table provided. This test is used to differentiate bacteria based on their ability to hydrolyze starch with the enzyme a-amylase or oligo-l,6-glucosidase. It aids in the differentiation of species from the genera Corynebacterium, Clostridium, Bacillus, Bacteroides, Fusobacterium, and members of Enterococcus. Starch is a polysaccharide made up of a-D-glucose subunits. It exists as a mixture of two forms, linear (amylose) and branched (amylopectin), with the branched configuration being the predominant form. 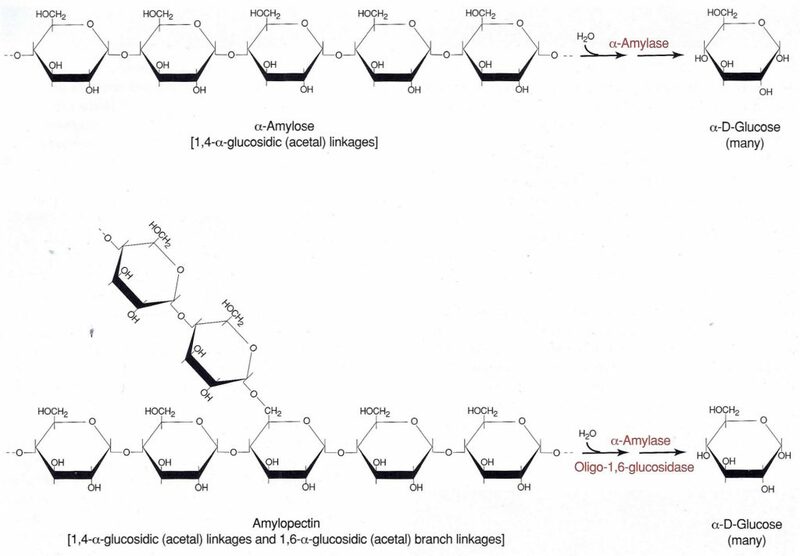 The a-D-glucose molecules in both amylose and amylopectin are bonded by 1,4-a-glycosidic (acetal) linkages (Figure 6-83). The two forms differ in that the amylopectin contains polysaccharide side chains connected to approximately every 30th glucose in the main chain. These side chains are identical to the main chain except that the number 1 carbon of the first glucose in the side chain is bonded to carbon number 6 of the main chain glucose. The bond is, therefore, a 1,6-a-glycosidic linkage. Starch is too large to pass through the bacterial cell membrane. Therefore, to be of metabolic value to the bacteria it must first be split into smaller fragments or individual glucose molecules. Organisms that produce and secrete the extracellular enzymes a-amylase and oligo-l,6-glucosidase are able to hydrolyze starch by breaking the glycosidic linkages between the sugar subunits. Although there usually are intermediate steps and additional enzymes utilized, the overall reaction is the complete hydrolysis of the polysaccharide to its individual a-glucose subunits (Figure 6-83). Starch agar is a simple plated medium of beef extract, soluble starch and agar. When organisms that produce a-amylase and oligo-Le-glucosidase are grown on starch agar theyhydrolyzethe starch in the medium surrounding the bacterial growth. Because both the starch and its sugar subunits are soluble (Clear) in the medium, the reagent iodine is used to detect the presence or absence of starch in the vicinity around the bacterial growth. Iodine reacts with starch and produces a blue or dark brown color; therefore, any microbial starch hydrolysis will be revealed as a clear zone surrounding the growth (Figure 6-84). Positive test: a clear zone around the line of growth after addition of iodine solution. A large carbohydrate molecule with hundred or thousands of glucose subunits. Since starch is so big, bacteria can’t use the valuable glucose molecules in it without first breaking it down. What is the enzyme used in Starch Hydrolysis? Amylase, which breaks (hydrolyzes) some of the bonds between glucose subunits. Which helps bacteria break down starch. What is the medium used in the Starch Hydrolysis Test? A Starch Agar plate, which is a standard agar plate with added starch. The starch is clear because it completely dissolves in water. How can you see starch on the Starch Agar Plate? You add Iodine to the plate after incubation. The Iodine forms a dark blue/black complex with starch but remains its original amber color in the absence of starch. What does a positive Starch Hydrolysis test look like? After incubation and the iodine is added the iodine will remain its original amber color around the bacteria that has the enzyme Amylase. What does a negative Starch Hydrolysis test look like? After incubation and the iodine is added the iodine will turn a dark blue/black complex with the starch that is intact. What does a positive Starch Hydrolysis test mean? It means that the bacteria has the enzyme amylase. What does a negative Starch Hydrolysis test mean? It means that the bacteria doesn’t have the enzyme amylase. What are the steps of a Starch Hydrolysis Test? Use a loop to streak each organism in a single line on the surface of the Starch Agar Plate. What is the reagent used? The purpose is to see if the microbe can use starch, a complex carbohydrate made from glucose, as a source of carbon and energy for growth. Use of starch is accomplished by an enzyme called alpha-amylase. How is alpha-amylase activity determined? A medium containing starch is used. After inoculation and overnight incubation, iodine reagent is added to detect the presence of starch. Iodine reagent complexes with starch to form a blue-black color in the culture medium. Clear halos surrounding colonies is indicative of their ability to digest the starch in the medium due to the presence of alpha-amylase. The medium used is starch agar. The medium is a nutrient agar to which starch is added. An inoculum from a pure culture is streaked on a sterile plate of starch agar The inoculated plate is incubated at 35-37 C for 24 hours. Iodine reagent is then added to flood the growth. Presence of clear halos surrounding colonies is positive for their ability to digest the starch and thus indicates presence of alpha-amylase. Iodine reagent is added after incubation to flood the surface of the plate. DIFCO Manual, 10th Ed., DIFCO Laboratories, Detroit, MI. Lanyi, B. 1987. Page 55 in Methods in Microbiology, Vol. 19, edited by R. R. Colwell and R. Grigorova, Academic Press Inc., New York, NY. MacFaddin, Jean F. 2000. Page 412 in Biochemical Tests for Identification of Medical Bacteria, 2nd Ed. Lippincott Williams & Wilkins, Philadelphia, PA.
Smibert, Robert M. and Noel R. Krieg. 1994. Page 630 in Methods for General and Molecular Bacteriology, edited by Philipp Gerhardt, R. G. E. Murray, Willis A. Wood, and Noel R. Krieg, American Society for Microbiology, Washington, DC.